Recently Xiaomi released the March Security update for the Mi A1 phone users and most of the users already updated their phone with this new update. The phone is still running on the Android 8.0.0 oreo version and the March update is security update with some bug fixes. But some of the Mi A1 users are facing lots of problem on their phone after applying this update. Some are facing bad battery backup on the phone, som eare facing app crashes and other major problems. 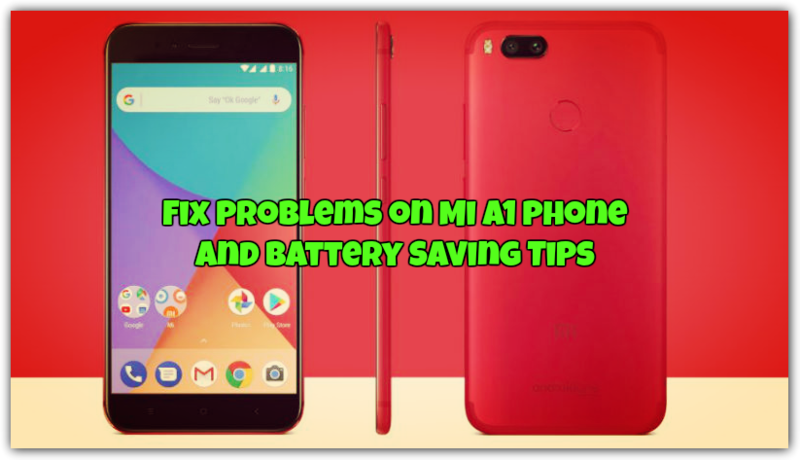 So today here in this guide I will let you know how to Fix Problems on Mi A1 Phone and Battery Saving Tips. We tested all these tips on our phone and the phone is working fine and these trick will not harm your phone. 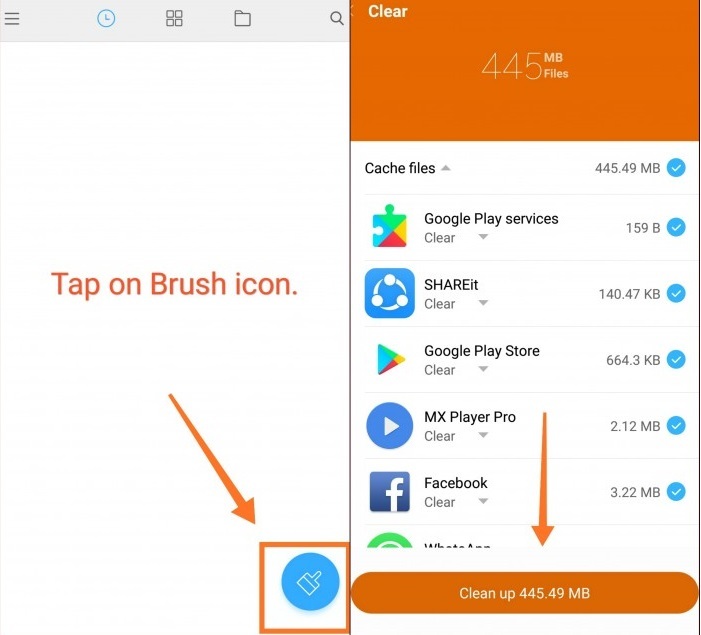 So if you are the MI A1 user and after the March update you are facing some problem on your phone, then read this guide completely and follow all the tips on your phone to fix major issues on Mi A1 and Get better battery life on your phone. So let’s get started and follow these tips to fix problems on your Xiaomi Mi A1 phone. 1.7 7. Change Battery Draining Settings. This one is the major cause of the bad battery life and heating up the phone. To fix this issue all you have to make some changes on your phone. 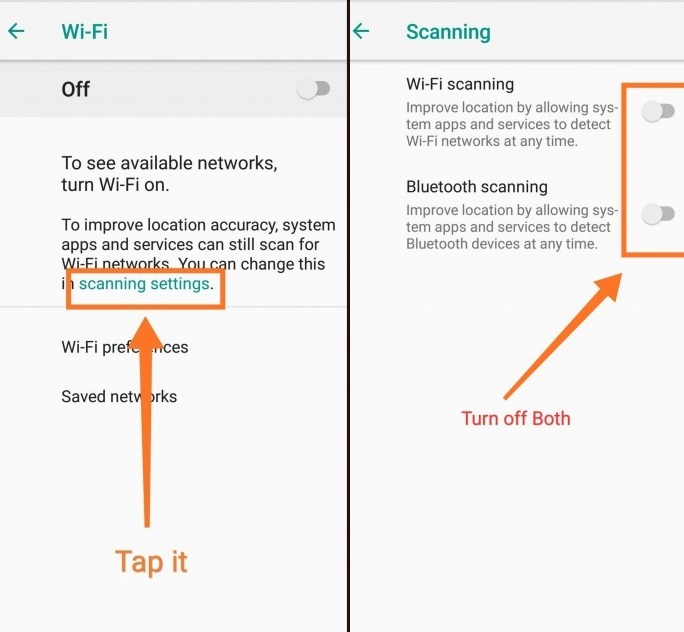 Go to your phone Wifi Settings, Turn Off the Wifi and you will see the scanning setting on the page. From here Disable Wifi-Scanning and Bluetooth Scanning. 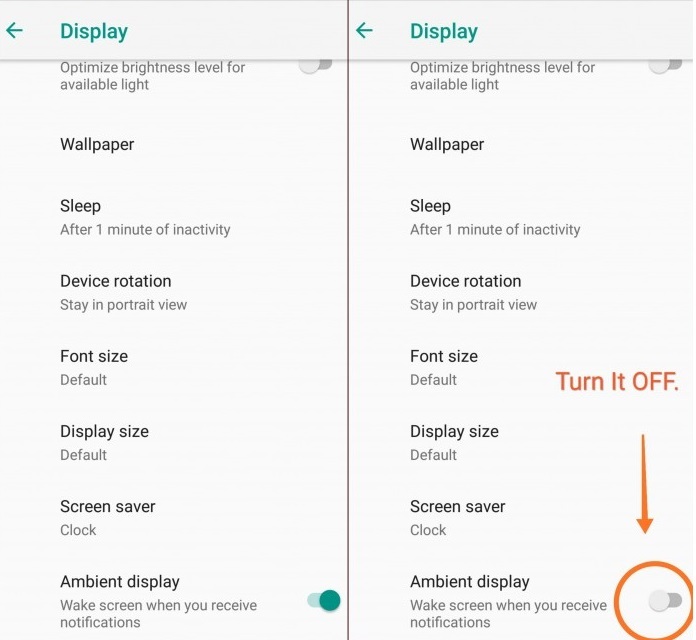 I know this is the good feature but consume lots of battery on your phone. 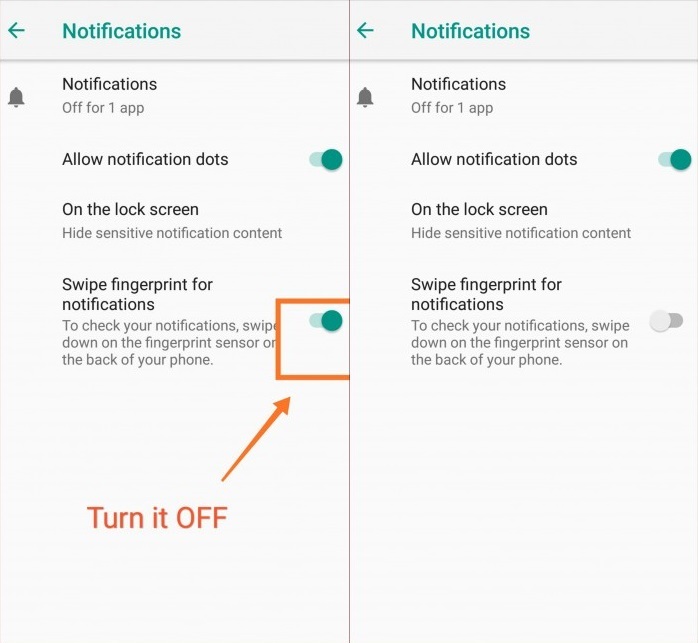 This Feature wakes up the screen, every time you receive A New Notification. That means consumption of more battery life. So disable it. To do this Go To SETTINGS > Display > Advanced and Scroll Down. And follow the instructions Provided In the image below. Most of the users are not using this feature on the phone. And if its enable and it will consume some memory on your phone and running in the background. So disable this feature on your phone. To Disable it. Go to Settings > Apps and Notification > Notification. Now, Follow the instructions Provided In the image below. 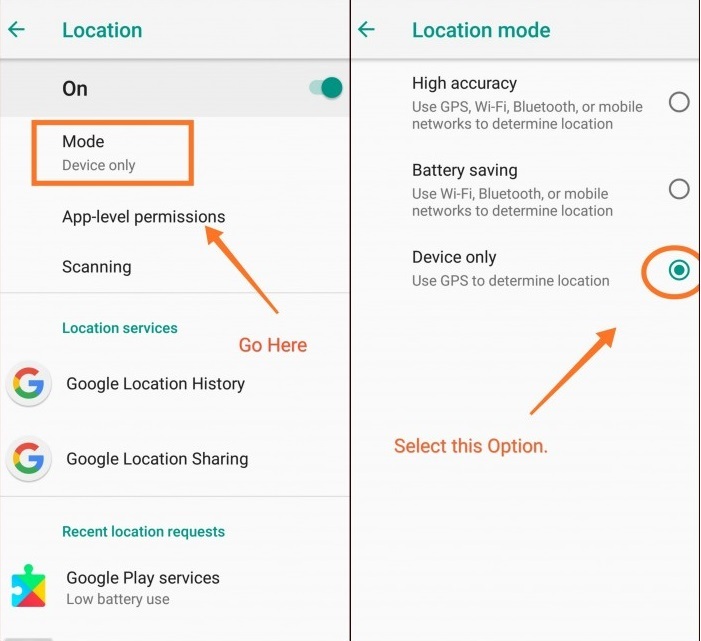 Location services is one of the most problem of battery draining on the Android phones. And this will Drain battery in the background. So Set it to the device only for most savings. Go to Settings > Security & Location > Location. And enable for Device Only. Mi A1 comes with lots of pre-installed apps and many users don’t use such app on their phone. And all those apps always running on the background. Ann create lots of problem like lag, battery drain and etc. I recommend You uninstall All These Un-Needed Apps. 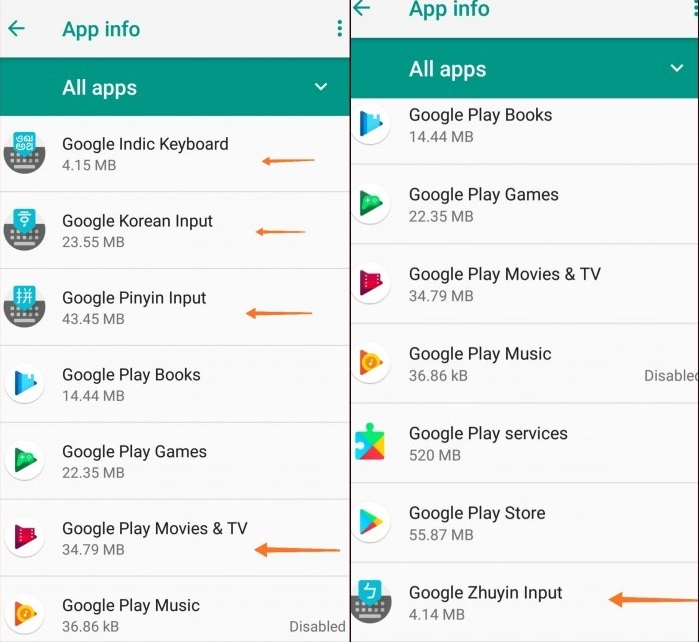 If you can uninstall them then Disable them, Disable These system Apps -As per you Preference. Go To Settings > Apps & Notifications > App info. Now Disable the apps highlighted in the Picture Below. 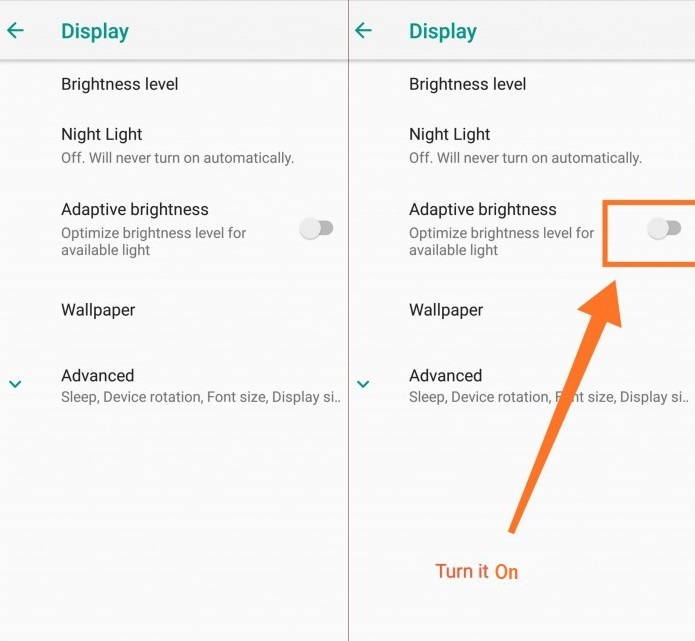 These are Minor settings and don’t have a huge impact on battery life. To Do This, Go To Settings > System > Developer options. 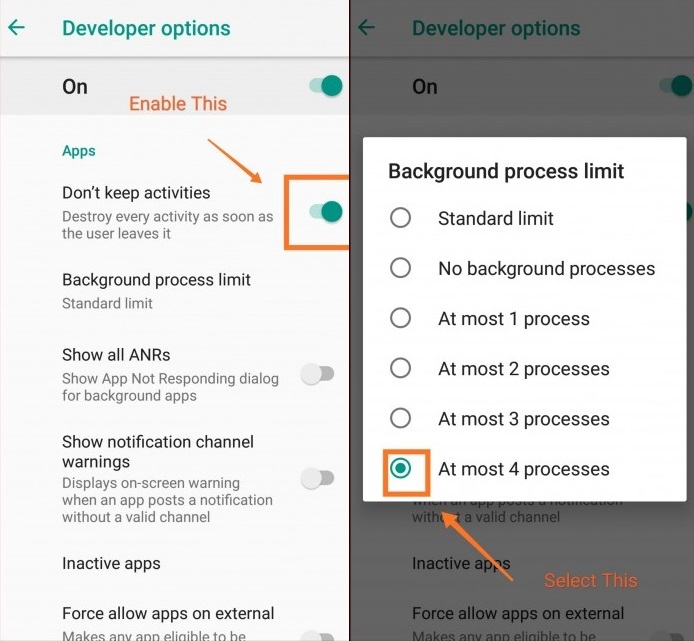 How to Enable Developer settings? Go to Settings > System > About phone, Now tap on Build no 7 times, Now Enter your Screen lock To Enable Developer options. Now, Follow the instructions Provided In the screenshot below. This is some new tips and Highly not recommended as it force stops all apps in the background to achieve better battery. Do at your own risk. Go to Settings > Developer Options. And make these changes on the settings panel. See the image below. 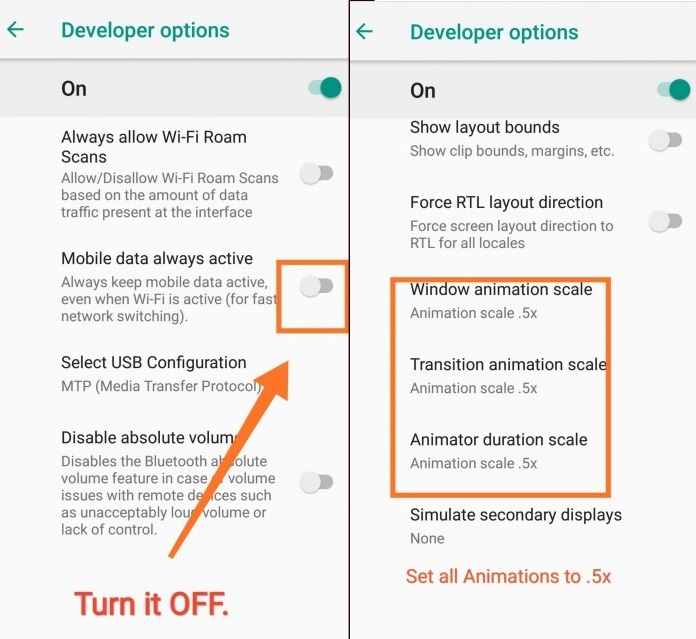 This is another reason for the slow performance of the phone and app crashes. Time to time you need to Clear Cache and Junk Files form Mi A1, For a better Performance & Battery Life. Download The Mi file explorer From here. Now open the app and Clear the Junk Files. If you are still facing the problem and bad battery life on your phone. Then try resetting your device, then implement all the above-mentioned Tips. After an update is recommended to rest the device so the old Apps files cache and files will remove from the phone. And make sure that all the app are updated on your phone. If you face any problem while trying these tricks comment below. Hope you all Like the Tricks, and if these work for you comment down below. hai,nice article.Thanks for the information.